Spring has sprung, you guys! And unlike many, this is the time when you'll find me baking. Not so much during the busy holidays, but spring! I love baking with berries, bananas, vanilla- and all of those things just fit into this time of year so perfectly to me. And a morning muffin with my coffee or an easy treat to bring to a party or shower? Yes please! I feel like everyone must have a banana bread recipe by now, maybe except for me. I just never had a "go-to" that fit the bill perfectly. 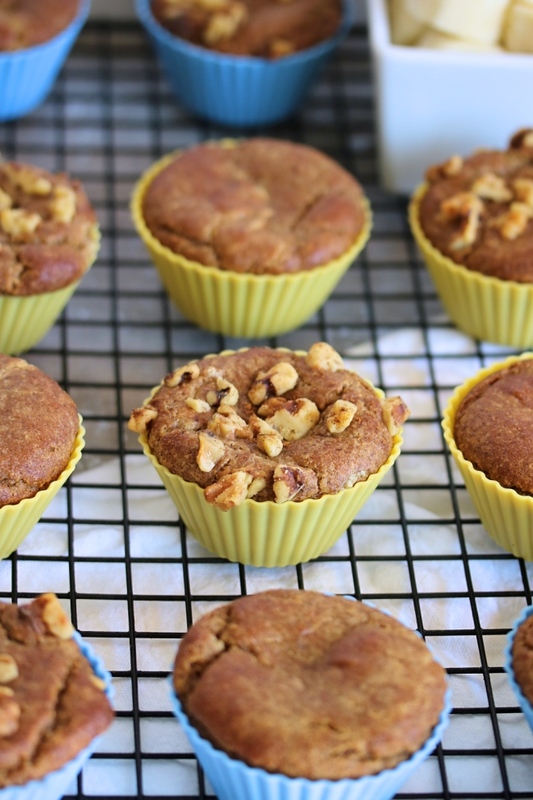 Easy, tasty, just the right texture- yet still Paleo and sweetener free. It took some trial & error, but I've got it (AND it has collagen!) and I'm so excited to finally share it with you! This recipe is a paid partnership with Vital Proteins, one of my favorite companies to work with! You all know by now that I love & swear by so many of their products, so I am super grateful for this opportunity to partner with them! My favorite part about these blender muffins, though? Slathering on a layer of frosting. 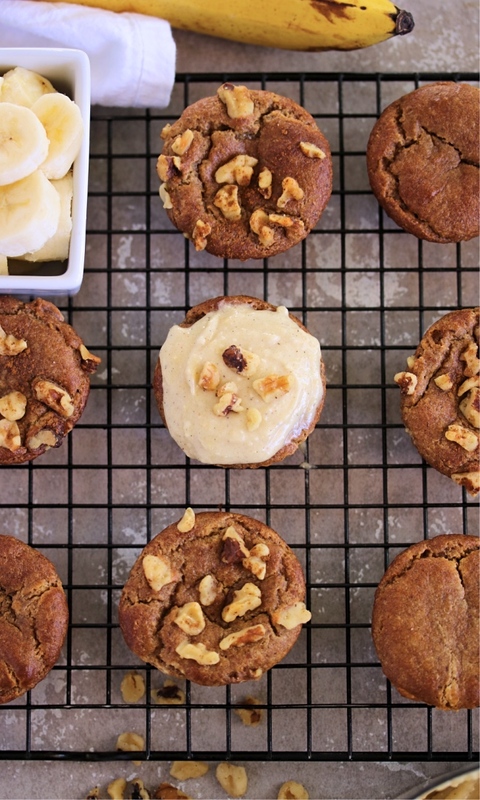 I know what you're thinking- Paleo + frosting = not a match, but bear with me. This frosting only has 3 Tbsp of sweetener (your choice of honey or maple syrup) and is actually filled with good-for-you ingredients! Healthy fats from cashews, coconut milk, and coconut oil (or ghee) are enough for me to sign right up. But then I took it to the next level by sneaking in some Vital Proteins Collagen Peptides! 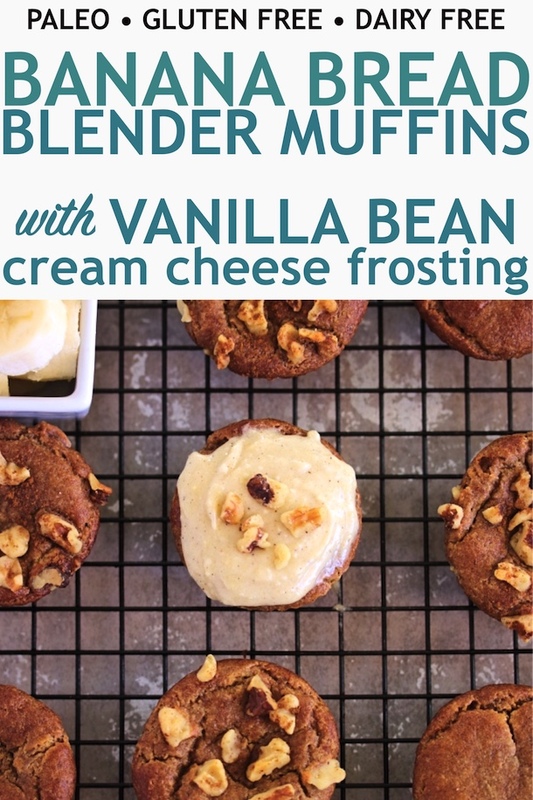 This adds protein to your frosting- you heard me! Protein! Which is so cool. And the vanilla bean flecks are just an added bonus. I mix some of Vital Proteins' Vanilla & Coconut Water Collagen Peptides right into the muffins too- because why not!? The muffins are great for breakfast or snacks on their own, but the frosting takes them from simple to delicious. 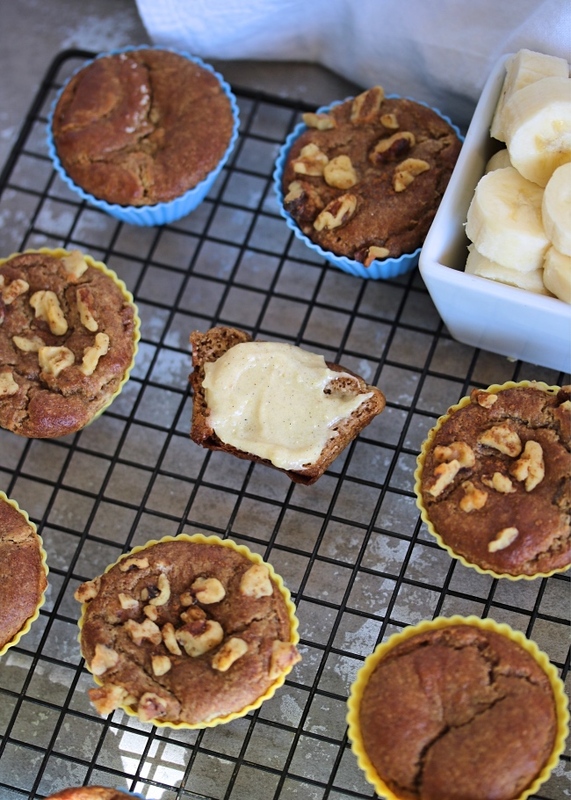 The Vanilla & Coconut Water Collagen adds a serious cheesecake flavor to the frosting & pairs so amazingly with the banana- you have got to try this! I love how the vanilla bean adds taste & texture, and I also love knowing that my frosting is actually nutrient dense & good for me! I'm so excited for spring to be here & to share ALL of the new recipes I've got up my sleeves! 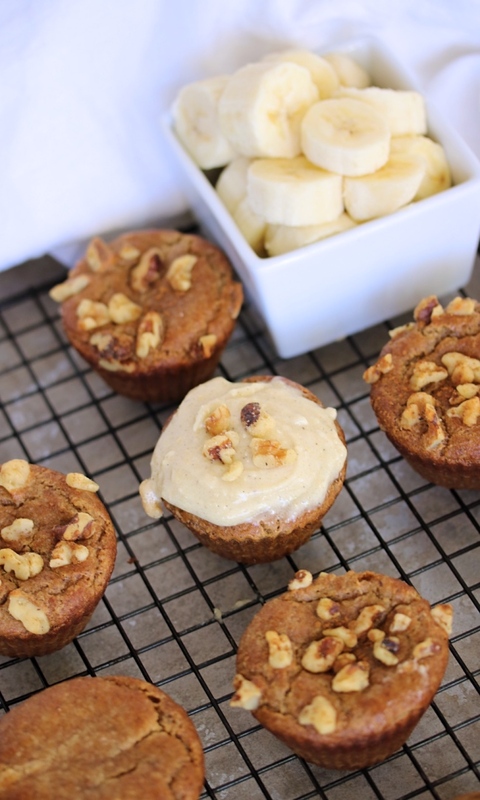 It's been a bit of a hiatus for me after the wedding & honeymooning and all, but I am happy to be back with these delicious frosted muffins, and to share with you another way to sneak in your collagen peptides- something I am asked about so often! If you're looking for the most versatile collagen product that you can bake with, yet also stir into coffee & blend into smoothies, this one would be my recommendation! It has great flavor yet is still an easy, dissolvable texture to work with. I hope you love this recipe as much as we do- and let me know if you make these! Preheat the oven to 350ºF. Line a 12 cup muffin tin with liners or grease each cup well. 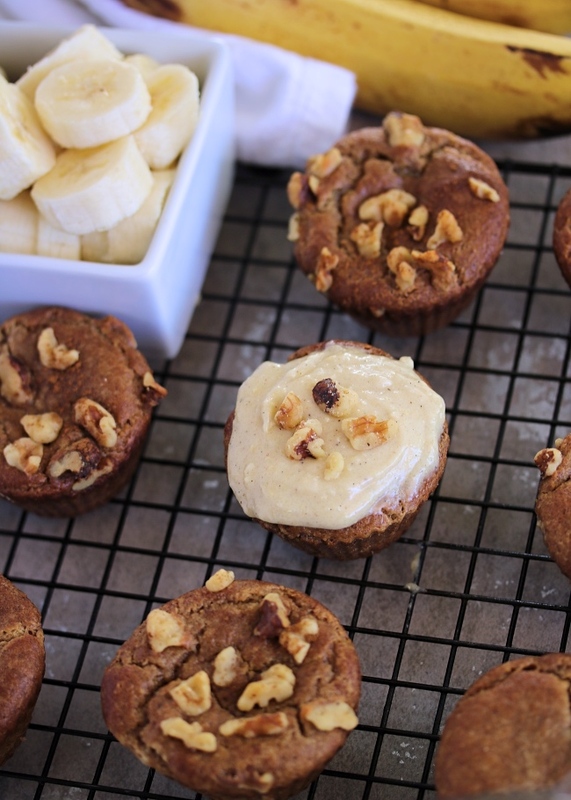 In a blender or food processor, pulse the nut butter, egg, and bananas until combined. Add the almond flour, collagen, baking soda, spices, and vanilla, and continue to pulse until the batter is smooth & well incorporated. Scoop the batter into the lined muffin tin, and transfer to the oven. Bake for 12 to 18 minutes, or until set. Allow the muffins to cool, and work on your frosting. To a blender, add all of the frosting ingredients. Blend until smooth & creamy. Spread the frosting over the cooled muffins and serve!